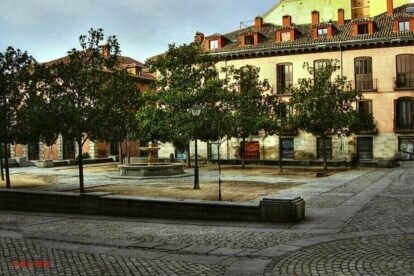 Plaza de los carros is a great beginning or end location if you’re touring around La Latina. La Latina has become in the last years one of the most popular locations, due to its bar and especially the active street Cava baja. Historically it’s been a strategic location to supply and distribute products. Workers left their carts with the products and that’s the reason for the name of the square. Nowadays it’s a great meeting point, as it’s within walking distance from Plaza de la Paja, Mercado de la Cebada, terraces, bars and restaurants. In the center of the square you will find a beautiful fountain which is surrounded by cemented places to sit. Plaza de los carros spot receives a lot of sun so its a great place to sit and relax for some minutes. This square used to have more life, as it was a popular location to have drinks in the street. Many neighbours complained and now the police controls the quietness of this strategic square, so tranquility is guaranteed. Sit, enjoy the surrounding classic buildings and/or the big mural painting just beside it.